Today’s first was perfect, timing wise. As I worked in the garden, planting the latest batch of flowers in the southern border, twilight descended. With the approaching darkness, mosquitoes began to whine around me. I looked down to see a couple landing on my bare arm. These pesky little creatures have not been a problem until this evening. I had intended to have a movie night after working in the garden, but as I slapped at mosquitoes, and looked at the amount of work I still had to do outdoors, inspiration struck. 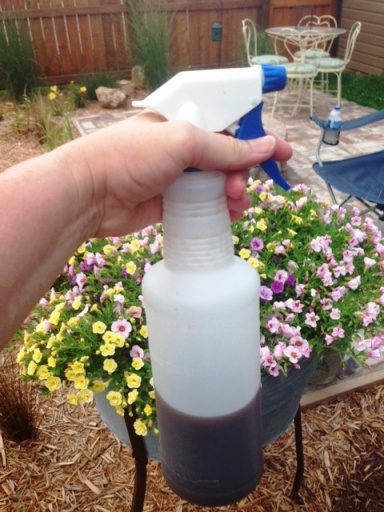 While at the lake house over the 4th of July, Cousin Pam brought out a bottle of homemade mosquito repellant, in case anyone was being bitten. I love DIY products and she shared the simple recipe. I knew I had all the ingredients at home and tucked the thought away for future use. Tonight, I remembered lemon juice and lavender oil, but I couldn’t remember the rest of the ingredients. A quick google search brought the easy recipe right up on Pintrest. Fill bottle with water and shake. Ready to use. It took me just a few minutes to make the repellant. The picture shows the finished product as yellow. Mine came out brown, with the added vanilla extract. I think there is clear vanilla extract if one wants to use that. I was excited to try this out. Back outside, I sprayed my exposed arms. I sprayed a small amount into the palms of my hands and dabbed the repellant onto my face and neck. What a wonderful scent! I worked in my garden until well after dark and although I saw several mosquitoes swarming around, none landed on me, and I didn’t get bitten at all. 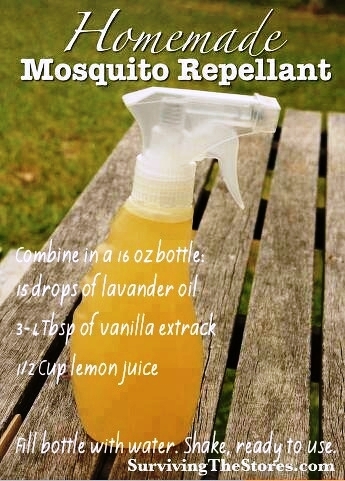 I’m delighted with this homemade repellant. No chemical smells and no chemicals on my skin. The spray didn’t burn or irritate my skin, on my arms or my face. And best of all, it smells so great, which is an added benefit when I’m working in the garden, sweating. Lavender is also soothing and calming. As I tucked flowers into the ground, and then gave them a long drink of water, I found myself humming and smiling. I’m always happy in the garden, but the lavender seemed to increase my sense of well being. What a great way to end a busy day! 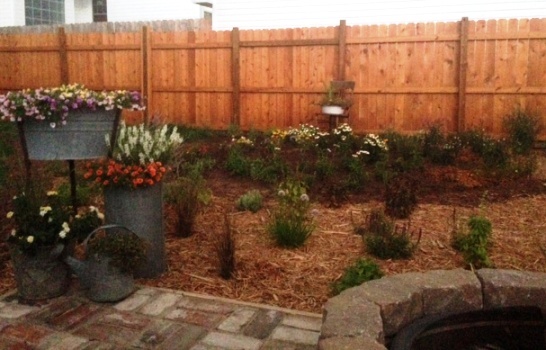 The border is progressing nicely!